The Penn High Center for Performing Arts is hosting a suicide prevention workshop for parents. Dr. Kay Antonelli welcomes Ms. Alice Jordan-Miles, MS Ed. She is the Assistant Director of the Behavioral Health and Family Studies Institute at Indiana University Purdue University-Fort Wayne. From the Palais Royale in downtown South Bend, Indiana, the PHM Educational Foundation is celebrating 20 years of supporting education in the Penn-Harris-Madison School Corporation. Tonight’s gala includes dinner, silent auction, and some very special performances by 15 district principals vying for votes and funding. You can watch the entire event here. 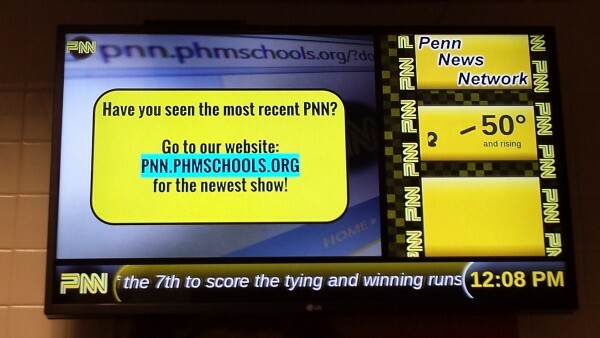 For more information about how you contribute to Penn-Harris-Madison schools, please navigate your browser to phmef.org. Watch the Penn Robotics team compete in Kokomo for the state championship. Get more information about Penn’s Team 135 here. The Penn Jazz ensemble is performing on Friday, April 1st, 10:50 AM EST at the prestigious Savannah Jazz Festival. You can watch their performance right here. Penn Pep Rally, 2015 Show, hosted by Jared & Zach. Today’s live event is the Northern Indiana First Technology Competition Qualifying competition. We are broadcasting LIVE from Penn High School’s main arena.